You're invited to attend a Grand Rapids Griffins home game of your choice during the regular season, courtesy of Huntington Bank. The first 15 Huntington Bank Debit or Voice Credit Card® holders to enter will receive 2 tickets to a Griffins 2018-19 regular season home game during January, February, March, or April. There are only 30 tickets (15 pairs) available per game, so move fast! Click the CLAIM NOW button below to access the special offer. Place a check mark next to the game you would like to choose (only one game per customer can be selected). Tickets will be electronically delivered to your Flash Seats account upon completion. You will have to enter your credit card number, but you WILL NOT be charged. Your card number acts as a form of identification. Instructions will be e-mailed to you on how to use your Flash Seats and enter the venue using a registered form of identification (credit card or driver's license) or by downloading the Flash Seats mobile app on your mobile device. It's as easy as that to attend a Griffins game for free! Seats are limited, so please act fast. First-come, first served, and only while supplies are available for Huntington Bank Debit and/or Voice Credit Card® holders. Seats get placed in a shopping cart and remain on hold for five minutes. If you are unsuccessful, try again in a couple minutes. All tickets are typically claimed within a few hours of the initial notification. Must be 18 years or older. NO EXCHANGES. Please be advised that any person exceeding the published ticket limit or violating the Terms & Conditions of Flash Seats may have some or all of their orders cancelled at the discretion of the Grand Rapids Griffins without notification. Multiple orders associated with the same name, account number, credit card, debit card, email and/or mailing/billing address may be considered exceeding the ticket limit. All ticket holders are subject to the terms and conditions on the ticket and any other Griffins policy. Tickets are available only while supplies last. No purchase is necessary. Eligibility: The 2018-19 Grand Rapids Griffins Ticket Giveaway (“Giveaway”) is available only to legal residents of Michigan who are at least eighteen (18) years of age as of the date tickets are claimed. The following individuals are not eligible to participate: employees and/or contractors of The Huntington National Bank or Grand Rapids Griffins (“Sponsors”) their affiliates and subsidiaries, and their immediate family members. Limit of one pair of tickets per customer, per season. How to Obtain Tickets: A total of 1,140 tickets (30 per home game x 38 home games) will be made available for home ice hockey matches during the 2018-19 season on a first come, first served basis. Eligible games, giveaway timing and redemption instructions will be identified on The Huntington National Bank’s Facebook page (facebook.com/HuntingtonBank). The first 15 registrants for each eligible game will receive two electronic tickets, which will be electronically delivered to a Flash Seats account upon completion. Instructions will be emailed to recipients on how to use Flash Seats and enter the venue using a registered form of identification (credit card, driver's license or mobile device with a downloaded Flash Seats app). Sponsors do not assume any responsibility for incorrect or inaccurate capture of entry information, technical malfunctions, human or technical error, seeding or printing errors, lost/delayed/garbled data or transmissions, omission, interruption, deletion, defect, or failures of any telephone or computer line or network, computer equipment, software or any combination thereof. Tickets cannot be exchanged for different dates or seat locations. Sponsors are not responsible for any tickets that are not received, or are lost or stolen. Conditions of Participation: By participating in this Giveaway, registrants agree to release, discharge, and hold harmless Sponsors, Facebook, their respective affiliates, subsidiaries, divisions, retailers, agencies, and their respective officers, directors, employees, and agents, from any and all damages whether direct or indirect, which may be due to or arise out of participation in the Giveaway or any portion thereof, or the acceptance, use, misuse, or possession of tickets. Sponsors reserve the right to cancel, suspend and/or modify the Giveaway, or any part of it, if any fraud, technical failures or compromises (including, but not limited to, malfunctions, interruptions, or disconnections in phone lines or network hardware or software, unauthorized human intervention in any part of the entry process or the Giveaway or technical or human error which may occur in the administration of the Giveaway and the processing of entries) or any other factor beyond Sponsors’ reasonable control impairs the integrity or proper functioning of the Giveaway, as determined by Sponsors in their sole discretion. Sponsors: This Giveaway is sponsored and promoted by The Huntington National Bank, 41 South High Street, Columbus, OH, 43287, and Grand Rapids Griffins, 130 West Fulton Suite 111 Grand Rapids, MI 49503. You acknowledge that the Giveaway is in no way sponsored, endorsed or administered by, or associated with, Facebook. BY ACCEPTING AND USING TICKETS, TICKETHOLDERS VOLUNTARILY ACCEPT THE INHERENTLY DANGEROUS NATURE AND RISK IN WATCHING HOCKEY (INCLUDING BUT NOT LIMITED TO FLYING PUCKS, BROKEN STICKS, HELMETS, ETC.) 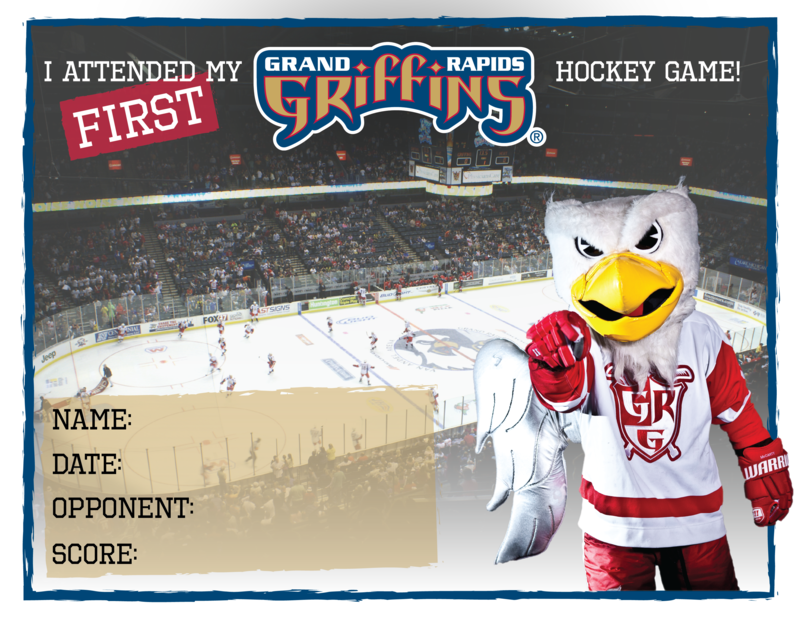 INCLUDING PERSONAL INJURY, PARALYSIS AND/OR DEATH, ACKNOWLEDGE THAT THEIR RESPECTIVE PARTICIPATION IN THIS PROMOTION AND THEIR SUBSEQUENT ATTENDANCE AT THEIR RESPECTIVE SELECT GRAND RAPIDS GRIFFINS HOCKEY GAME IS ENTIRELY VOLUNTARY, ACKNOWLEDGE THAT THERE ARE NATURAL FACTORS AND OCCURRENCES WHICH MAY IMPACT ON OR AFFECT THE SAFETY OF THE ACTIVITIES THEY ARE PARTICIPATING IN AND THEY VOLUNTARILY ASSUME ALL RISK OF SUCH FACTORS AND OCCURRENCES AND FURTHER ACKNOWLEDGE, STIPULATE AND AGREE THAT HUNTINGTON NATIONAL BANK, THE GRAND RAPIDS GRIFFINS, THE VAN ANDEL ARENA, AND THEIR RESPECTIVE PARENTS, AFFILIATES, SUBSIDIARIES, DIRECTORS, OFFICERS, EMPLOYEES, AGENTS AND ASSIGNS ARE AND SHALL NOT BE IN ANY MANNER WHATSOEVER LIABLE FOR ANY RESULTING DAMAGES, INJURY AND/OR DEATH. Member FDIC.® and Huntington® are federally registered service marks of Huntington Bancshares Incorporated. © 2018 Huntington Bancshares Incorporated. All rights reserved.